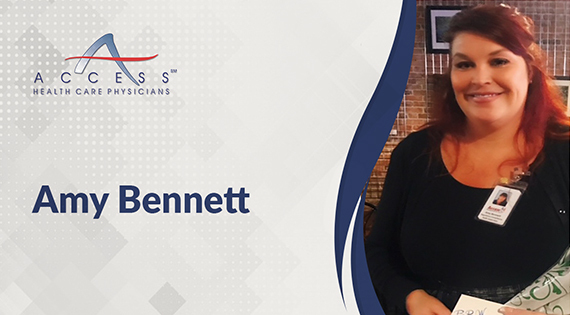 Access Health Care Physicians, LLC would like to recognize Amy Bennett, our Regulatory Compliance Audit Supervisor/Corporate Safety Officer for giving her powerful motivational speech on July 24th at the BPW Hernando meeting held at Rising Sun Bistro. In her “Eye of the Tiger” deliverance, she spoke of overcoming family obstacles, fighting personal timidity, life as a military wife when your husband does not come home the same and the importance of honest self-reflection. She emphasized how small steps, that may seem insignificant, have a way of being turning points leading to your true path. With her teenage daughter in the audience, she inspired professional women from all backgrounds with her life story of perseverance and dedication. We are very proud of Amy for inspiring the woman of Hernando County where we have grown, where we love! Access Health Care Physicians, LLC is a multi-service medical practice consisting of over 185 healthcare providers with over 1,015 workers at more than 125 locations throughout Florida. Our healthcare professionals provide a wide range of services not only in our offices but within patients’ homes. Yes, we make house calls. Access Health Care Physicians, LLC main office is located at 5350 Spring Hill Drive, Spring Hill, Florida 34606.